Life is a chain of events that you don’t expect to happen. In the world of this lo-fi garage band, we are all just stupid toddlers wondering what will happen next. Bedtime is a really nice album of rock songs with psychedelic guitar tones. Throughout the eleven songs, the band has many grooves and ideas. Album opener “Don’t Know Why” is an upbeat surf rock number about staring blankly while waiting for the clock to turn. B-Side starter “I’m so…” is reminiscent of a Nirvana song, only a lot more timid, though it’s backed by their distorted guitar amps and driving drums beats. Dunes come from a rich music scene. The four members are also involved in other creative projects that are a testament to how Sudbury is a cool place to live. With bands like Mick Futures, Howie Moonlight, Dirty Princes and (now Toronto-based) Casper Skulls. Lyrically the album covers silly acknowledgments of material objects like refrigerators and telephone wires while also being serious about the difficult relationship that we can have with others and ultimately ourselves. 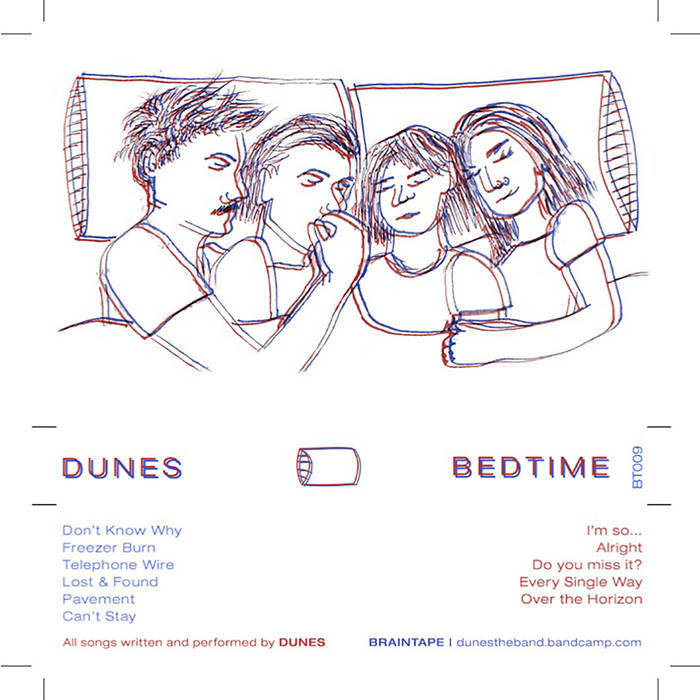 No matter the lyrical content, Dunes do a great job in creating cute and danceable music that pays homage to the idea of not taking yourself too seriously and utilizing do-it-yourself art theory. Final track “Over The Horizon” is the most thoughtful song on the album with melancholic vocals, a rollicking bass line and subtle drum grooves that bring the listener back to school with portable CD players & scraped knees. They’re a fun band of rock and roll musicians that capture the salty and sometimes sad feels of playing in 2017’s unique music environment.